As the 2019 national and provincial elections draws closer, two prevailing representations of South Africa’s youth have continued to predominate. The first portrays young South Africans as politically engaged drivers of change, drawing on the experiences of the recent #FeesMustFall movement as well as reflections of the youth activism of the 1980s. In contrast, the second image tends to depict the post-apartheid generation as politically disillusioned and disengaged from conventional politics, as part of a broader narrative concerning democratic recession and crisis. This seminar provides an overview of representative survey data spanning the last two decades in order to critically engage with these stereotypes. 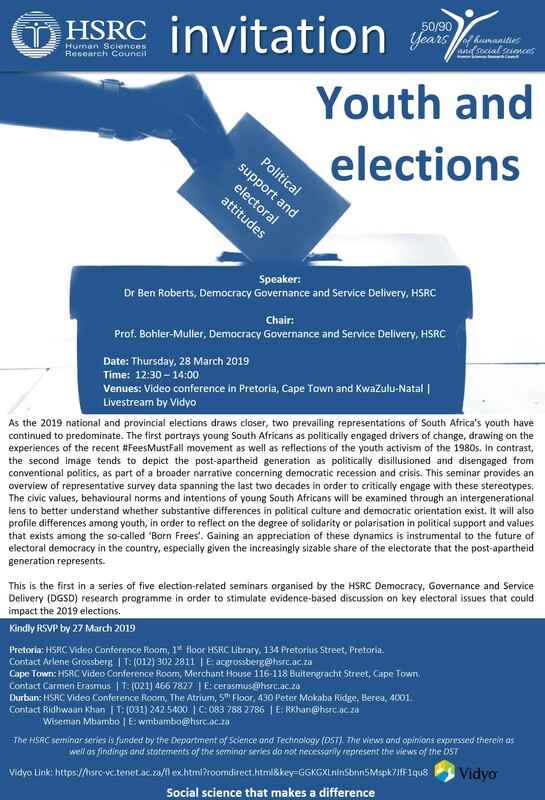 The civic values, behavioural norms and intentions of young South Africans will be examined through an intergenerational lens to better understand whether substantive differences in political culture and democratic orientation exist. It will also profile differences among youth, in order to reflect on the degree of solidarity or polarisation in political support and values that exists among the so-called ‘Born Frees’. Gaining an appreciation of these dynamics is instrumental to the future of electoral democracy in the country, especially given the increasingly sizable share of the electorate that the post-apartheid generation represents. This is the first in a series of five election-related seminars organised by the HSRC Democracy, Governance and Service Delivery (DGSD) research programme in order to stimulate evidence-based discussion on key electoral issues that could impact the 2019 elections.